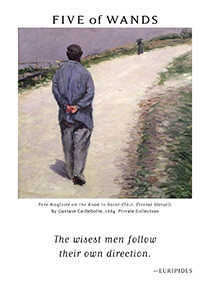 Let your focus be on advancing your cause. 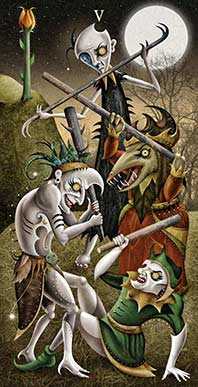 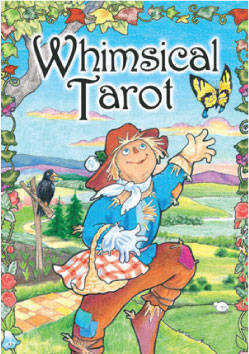 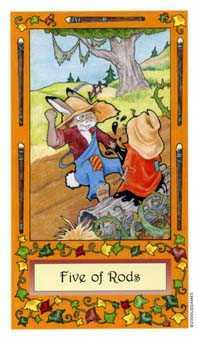 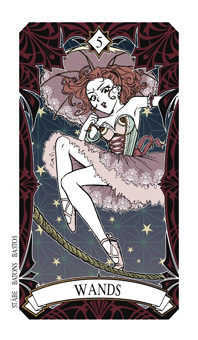 Whimsical deck © U.S. Games Systems, Inc. 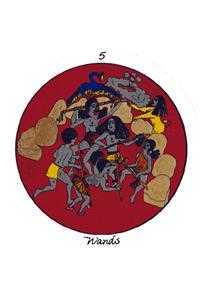 The Five of this suit symbolizes struggles caused by ambitious maneuvering and a competitive urge. 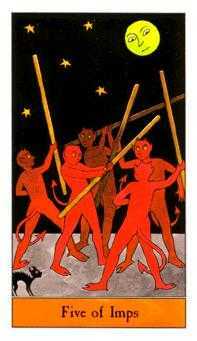 This could be about someone who is pushing his or her agenda forward at the expense of others. 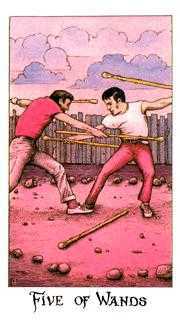 There can be a fine line between demonstrating personal excellence and making others feel like losers. 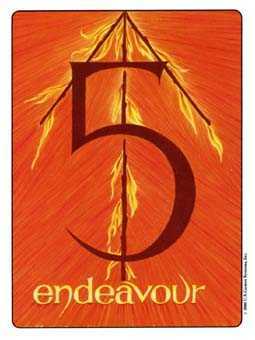 It may be necessary to ask yourself, who is it that really benefits when we all fight so hard for such small rewards? 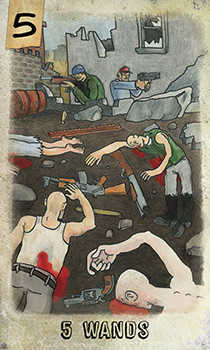 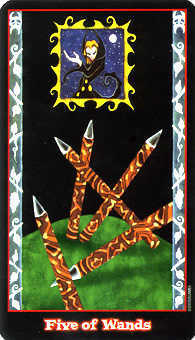 Am I serving a negative, manipulative agenda when I start applying battle metaphors to business? 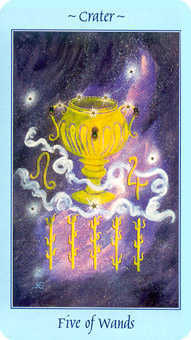 Even when your only motive is to be the best you can be, it is understandable to want recognition for what is fine and unique about you. 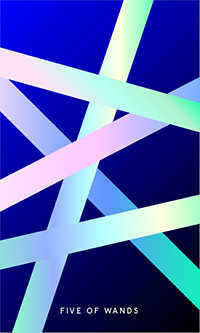 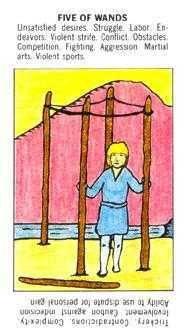 However, minimize the number of egos bruised in the process or your success will be celebrated alone. 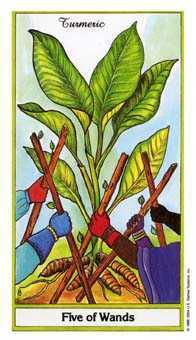 Identify your passions and build your mission around them. 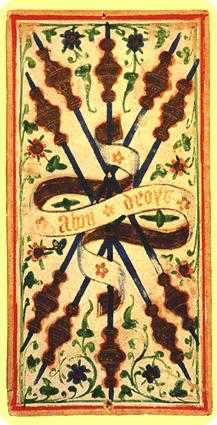 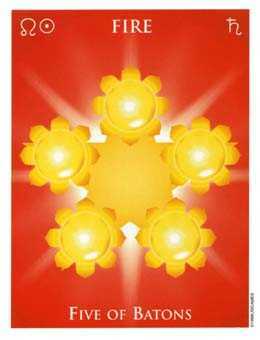 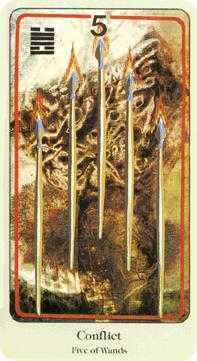 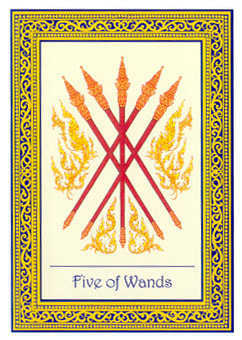 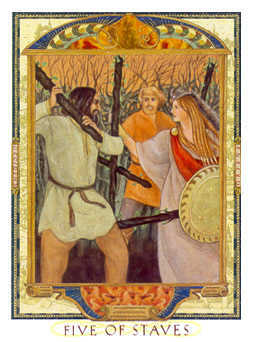 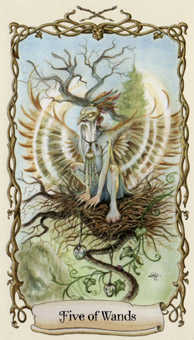 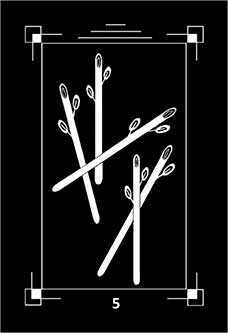 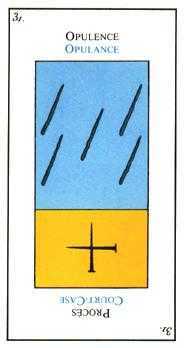 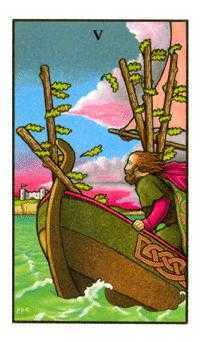 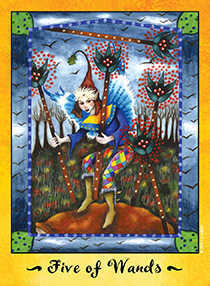 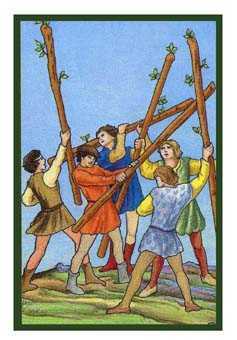 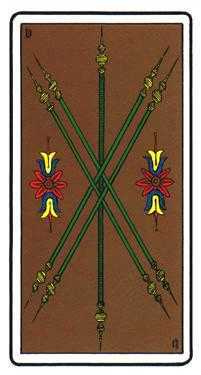 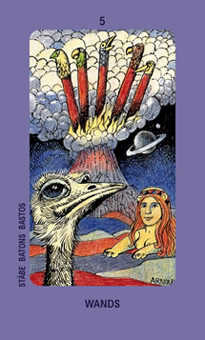 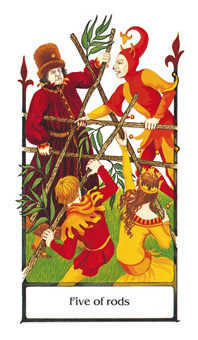 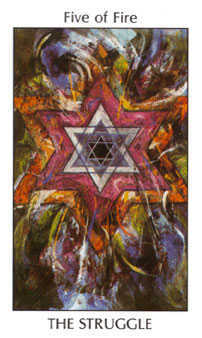 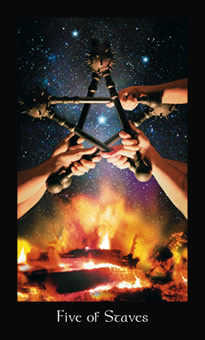 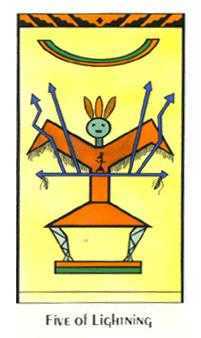 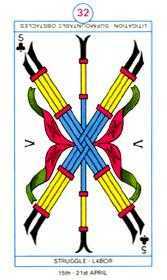 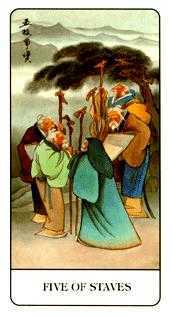 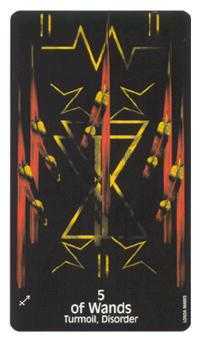 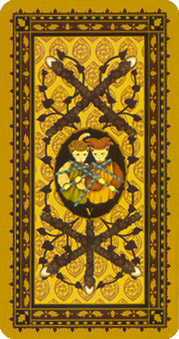 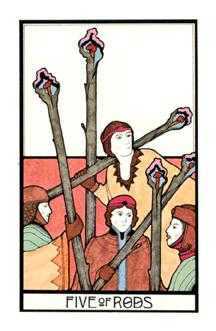 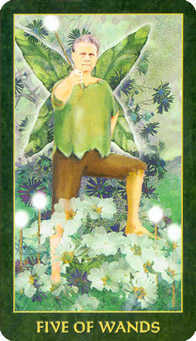 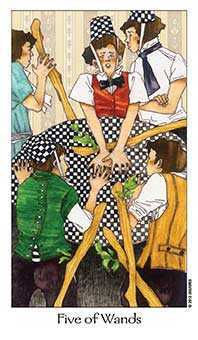 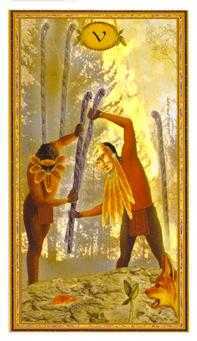 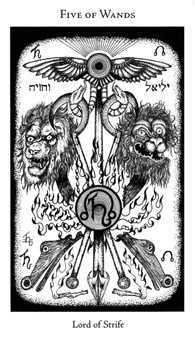 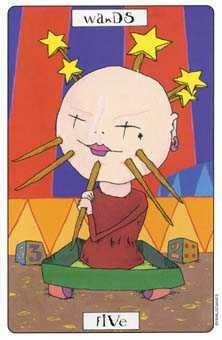 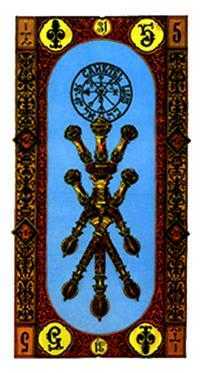 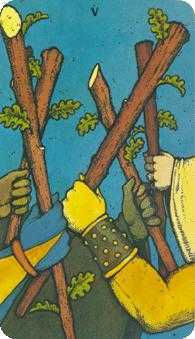 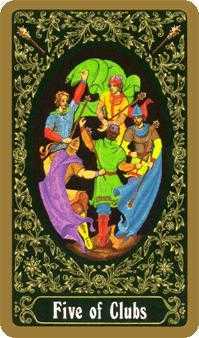 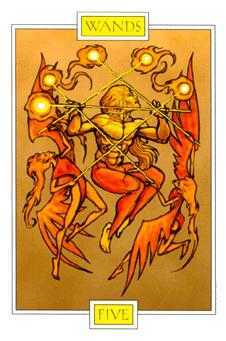 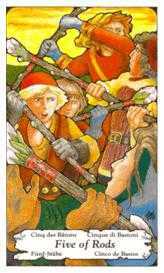 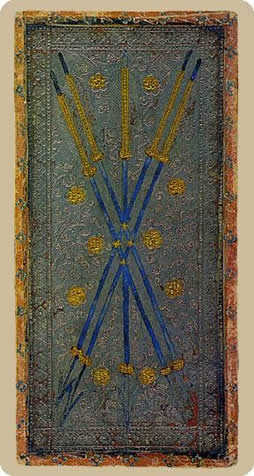 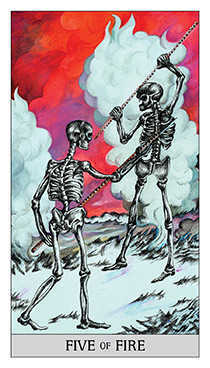 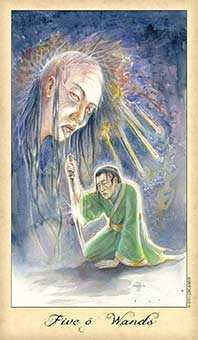 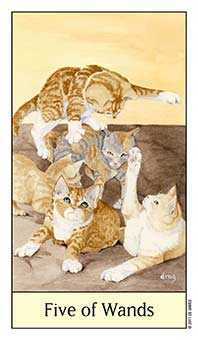 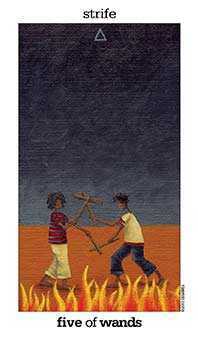 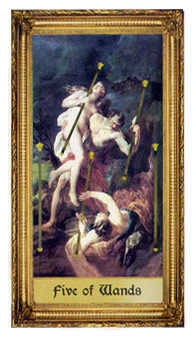 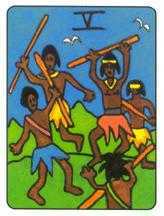 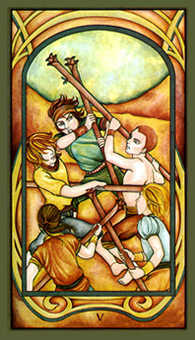 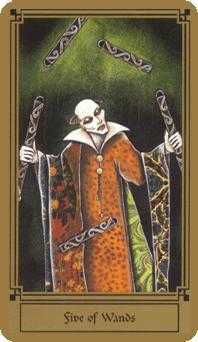 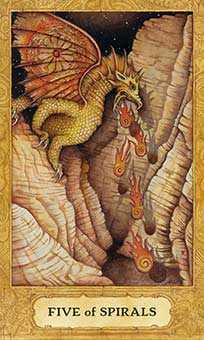 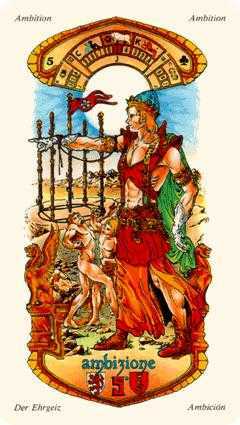 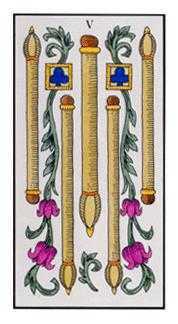 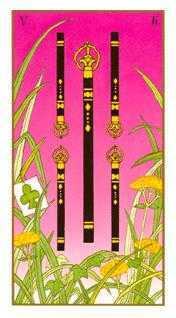 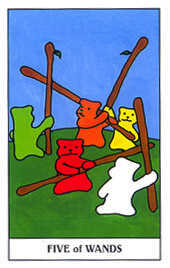 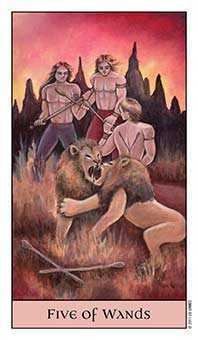 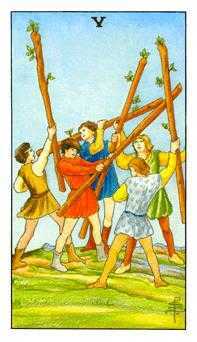 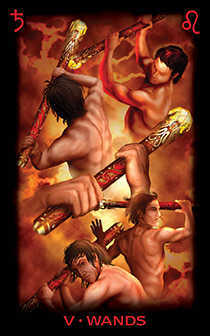 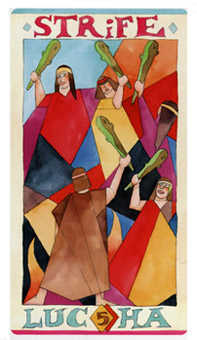 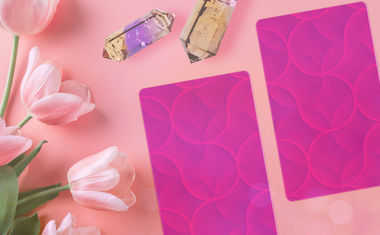 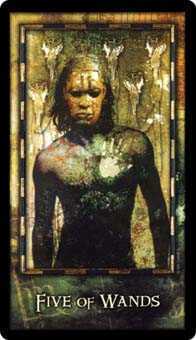 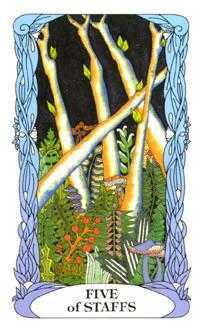 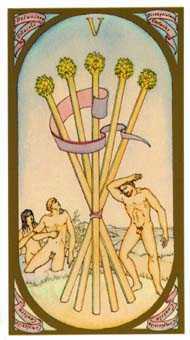 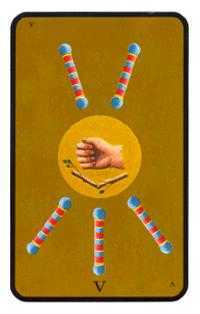 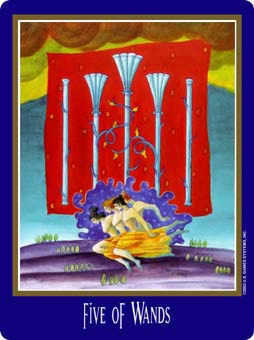 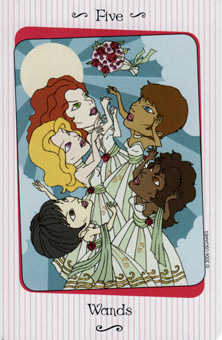 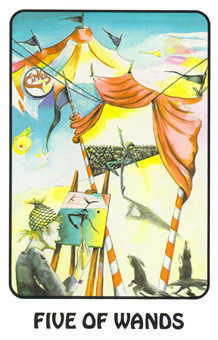 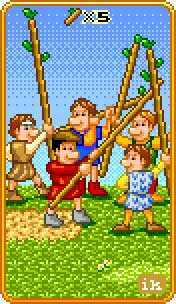 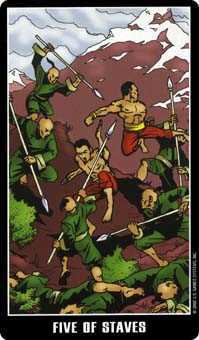 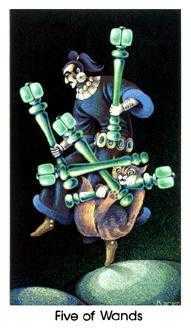 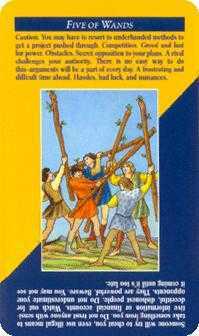 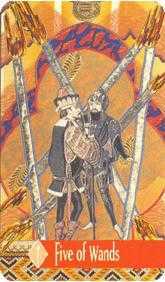 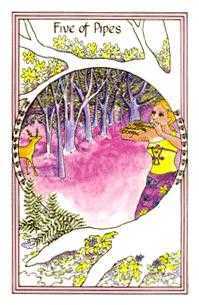 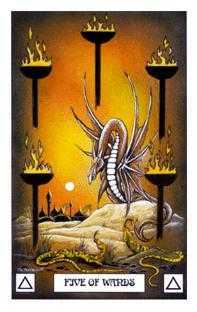 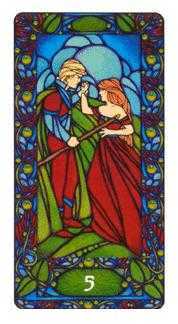 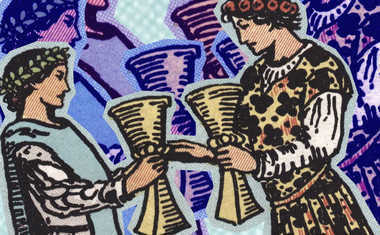 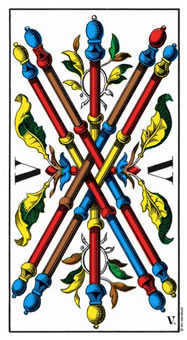 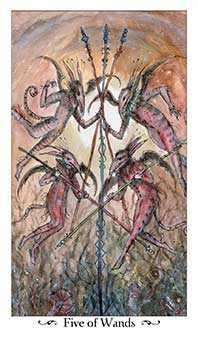 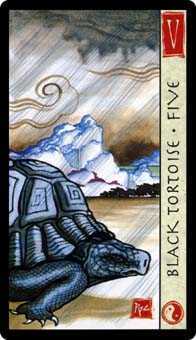 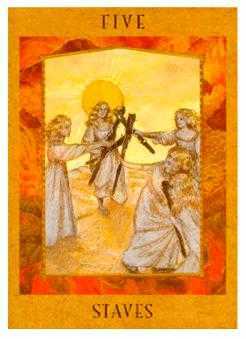 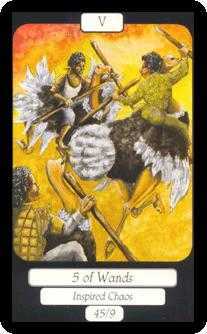 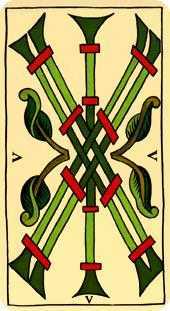 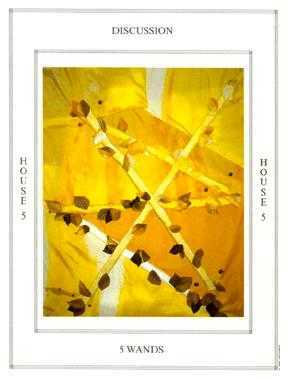 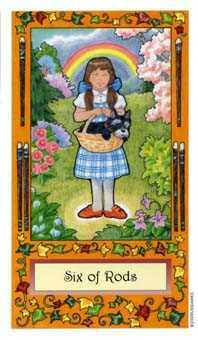 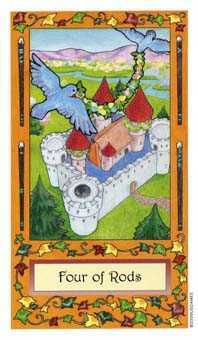 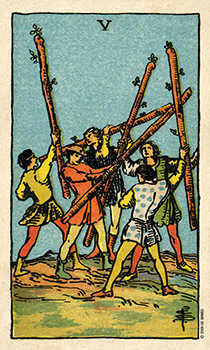 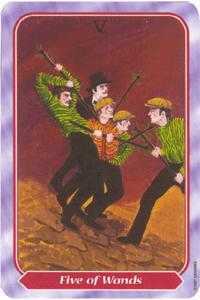 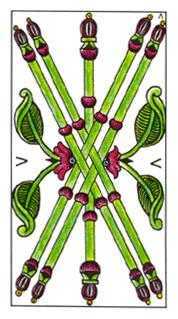 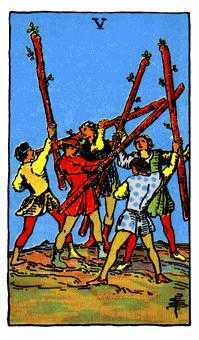 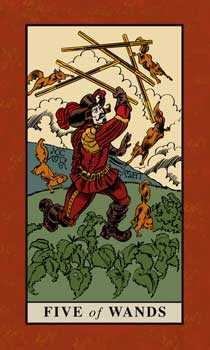 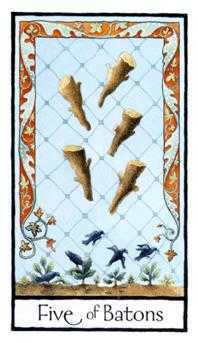 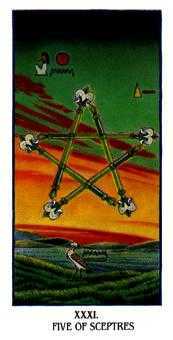 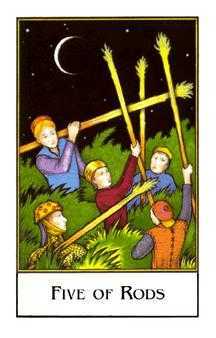 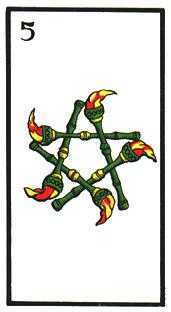 The Five of Wands in this position encourages you to find your natural ambition. 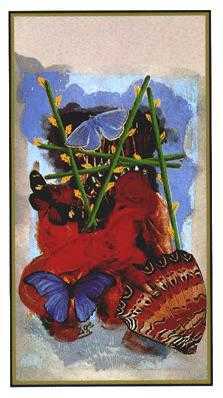 Identify what energizes you, what you would fight for and what you are passionate about -- even when you're tired or discouraged. 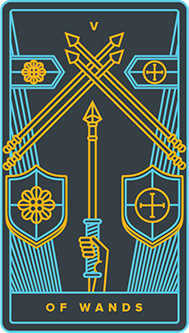 Strive to make that the centerpiece of your mission. 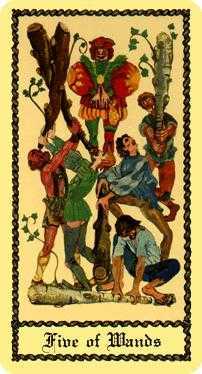 This is how you find your livelihood and establish your path of service.